1006-STR Roadware Easy Injection static mixer for Roadware 10 Minute Concrete Mender 600ml Cartridge. Roadware 10 Minute Concrete Mender™ and Easy-injection mixers make full depth crack repairs in hairline cracks without cutting. This less evasive crack repair technique breaks the rules for concrete repair. Hairline cracks are not worth the trouble fixing. You have to cut open a hairline crack if you want to actually repair it. Crack injection requires pumps, ports, slow epoxy, and lots of time. Lets look at these, “rules” one by one. Broken Rule One: Hairline cracks are not worth the trouble fixing. Did you know that just about every crack in concrete started out as a hairline crack? Some so fine, you can not even see them with the naked eye. Cracking naturally occurs in concrete slabs as the concrete cures and shrinks. We use saw cut control joins to encourage the concrete to crack inside the saw cut or tooled joints. The problem is, the concrete doesn’t always listen and can crack where it wants to crack. We don’t like it, but that’s just the way it is. The truth is, we would fix hairline cracks if there was a good and efficient way to do it. Most of the time, we ignore hairline cracks and blame them on the nature of concrete and say things like, “It will be fine, you still have aggregate interlock and the crack is just on the surface.” Or, “All concrete cracks, and its just the nature of the product… Check out our new floor covering selection.” The customer, who just invested in a new concrete floor, is never happy with these explanations. The truth is, we would fix hairline cracks if there was a good and efficient way to do it. Scoring a concrete crack with a diamond grinder. Broken Rule Two: You have to cut open crack if you really want to repair it. A repair material has to actually get into a crack so it will actually do some good. Anything short of that is no better than caulk. For the most part, this is true. We can’t repair what we can’t reach. Traditional cut and cover techniques us a diamond blade saw to open up a crack, forming a shallow well for Concrete Mender to accumulate and flow down into the crack. It works really well and Roadware has been doing this for over twenty years. Broken Rule Three: Crack injection requires pumps, ports, slow epoxy, and lots of time. Delivery of materials to the repair area. The repair material needs to set before if flows away from the repair area . The repair has to be structurally effective. Roadware Easy Injection mixers make getting Concrete Mender cracks as small as 20 mil (0.02 inches) simple. Just drill a 3/8 inch hole into the crack and push the nearly water thin Concrete Mender into the cracks. You can actually watch the Concrete Mender flow along the length of the hairline crack. Leave the expensive injection pumps in the shop. A cartridge of Concrete Mender and a manual application gun is all you will need. Roadware 10 Minute Concrete Mender starts to thicken and cure in about 5 minutes after application, so the material will stay where you put it. Traditional injection epoxies take hours to cure. In many cases, at the end of the day, the epoxy all ends up under the slab and no longer in the crack. Roadware 10 Minute Concrete Mender™ with Microdoweling™ penetrates traditional bond lines and repairs concrete from the inside out. This structural polyurethane will not become brittle over time. Epoxy injection resins become very hard and brittle. As the the concrete deflects under traffic, the brittle epoxy will start grinding away at the bond-line and the deterioration will start all over again. Roadware 10 Minute Concrete Mender is designed to restore aggregate interlock and deflect with the concrete under heavy traffic and loading. This structural polyurethane will not become brittle over time and is designed to bring the cracked concrete back to original pre-cracked condition. Roadware 10 Minute Concrete Mender with Easy-injection mixer repairing a hairline crack. Concrete Mender crack injection into 24 inches of concrete. Notice the material penetrating full depth. 600ML (300x300) dual cartridge application tool for all Roadware 600ML cartridges. Roadware will exhibit in the Global Cold Chain Expo 2017. Look for us in Booth 5128. The GCCE covers all aspects of cold storage warehousing and logistics. Roadware 10 Minute Concrete Mender™ is the go-to product for repairing cracks, joints and spalls in all kinds of refrigerated and freezer warehouse applications. The cold environment and heavy weight traffic in a freezer warehouse represents the ultimate challenge for a concrete repair material. Roadware 10 Minute Concrete Mender™ has been used for over 20 years in tough cold storage environments. The Roadware booth will feature Roadware 10 Minute Concrete Mender™ and Safety Yellow Concrete Mender™ for creating permanent yellow safety lines in freezer floors. The 2016 Global Cold Chain Expo in Chicago. See Roadware in Booth 5128 at the 2017 Global Cold Storage Expo in Chicago. For reduced or free admission to the GCCE, contact Kelton Glewwe – kglewwe@concretemender.com, by June 1st, 2017. For qualified attendees only. Limited time offer. 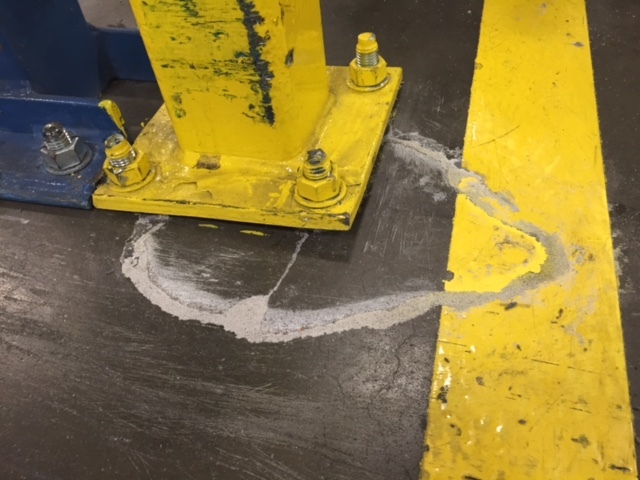 Floor repair stands up to forklift damage. 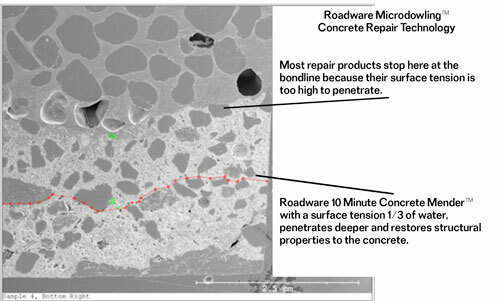 The Microdoweling™ action of Roadware 10 Minute Concrete Mender™ can structurally, “glue” concrete back together. 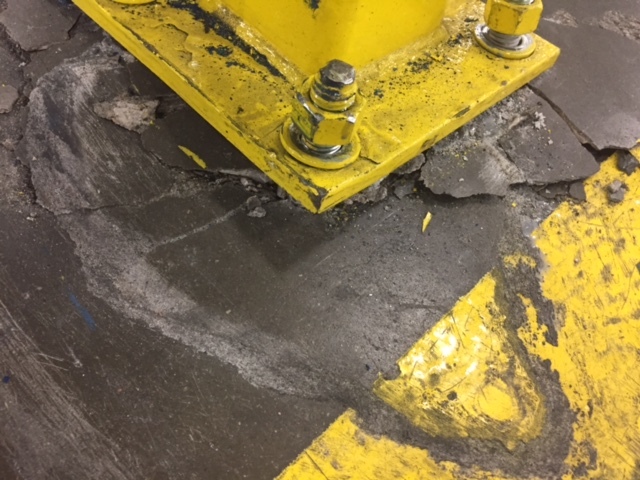 Pictured here is a concrete break-out caused by a forklift hitting an anchored steel bollard. 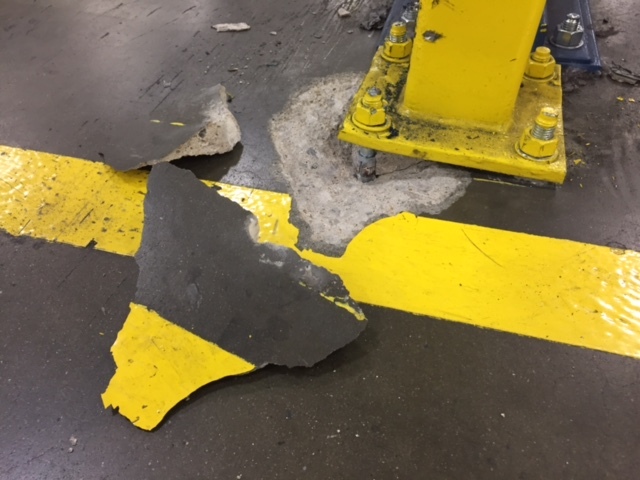 Anchored post hit with forklift causing damage to floor. Concrete Mender™ was used to re-attach the broken concrete piece and repair the crack. 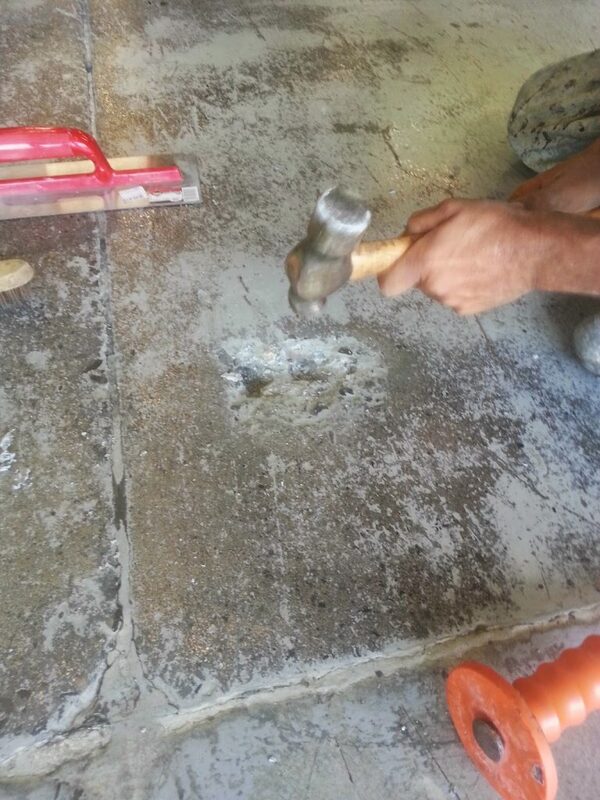 Damaged floor anchoring steel post is repaired and loose concrete piece re-attached with Concrete Mender™. After about 10 minutes, the repair was buffed smooth and open for traffic. Concrete Mender™ repair is buffed smooth and ready for service. About a week later, the bollard was again hit with a forklift and at the same angle. The repaired concrete held in place. The concrete broke on the other side of the bollard this time. Concrete Mender can’t stop forklifts from hitting bollards. It can help minimize the damage and make lasting repairs. Concrete Mender floor repair one week after installation. The steel post was hit again with a forklift and is still holding in place. At Roadware, we see lots of two-component polymer concrete repair products that claim to be just like Concrete Mender™. One even calls it self, “Quick Mender.” They are all basically polyurea based products that are too thick to effectively penetrate concrete surfaces and are so reactive, they become too sticky and gooey to trowel in just a minute or two after mixing. When you dig a little deeper, you will see a very distinct difference in genuine Roadware 10 Minute Concrete Mender™. Origin: NATO program for rapid bomb damage repair on runways. Function: To penetrate deep into concrete cracks, joints, and spalls creating a structural repair in 10 minutes. Civilian Use: Repair cracks, joints and spalls in commercial, industrial and civil applications. Surface Tension is a measurement of the ability of a liquid to overcome its own internal friction and penetrate into a material like concrete. Roadware 10 Minute Concrete Mender™ has a surface tension One third of water. It will penetrate concrete cracks and fissures quicker and deeper than water. This low surface tension lets Concrete Mender™ penetrate normal bond lines and allows structural bonding with the aggregate in the concrete. See the electron microscope slide below. Low surface tension has another little hidden benefit. It allows Roadware 10 Minute Concrete Mender™ to be combined with more than two parts sand and still be workable and trowel-able. Try that with a polyurea and you will have a gooey mess on your hands. Roadware 10 Minute Concrete Mender can be bucket mixed and applied like or mortar. Slab to slab micro-doweling action, provided by Roadware 10 Minute Concrete Mender, links concrete slabs together, locks them in place and allows for full-traffic, dynamic-load transfer, in 10 minutes. This micro-doweling action is more compatible with concrete and less re-active in harsh environments than even Poly-coated re-bar. Millions of micro-dowels penetrate, then bridge and bond, side by side, broken and jointed slabs. Hairline cracks, trench wide cracks, irregular cracks, cured control joints and variable depth spalls are candidates for this amazing technology. Scanning electron microscope image of the interface between Concrete Mender™ and concrete. In 10 minutes, at 70°F (21°C) , this micro-doweled bond has the same compressive and shear strength as poured and fully cured concrete. This makes bond-line failures a thing of the past. 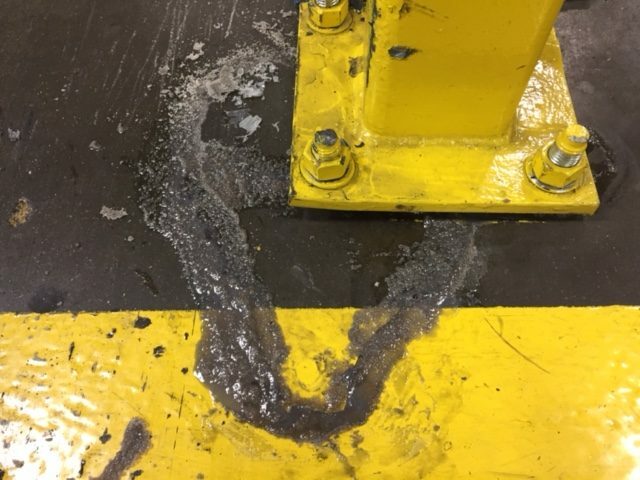 Parallel re-cracking, often experienced when epoxies cure out, are eliminated with Roadware’s micro-doweling technology. Roadware 10 Minute Concrete Mender™ is a polyurethane based material that restores structural integrity and aggregate interlock to distressed concrete by using low surface tension and low viscosity to penetrate concrete surfaces and cross -linking polymer chains to bond directly to the concrete-aggregate matrix. This bonding action utilizes capillary forces to self-inject polymer chains into the surrounding concrete. This material should have a modulus of elasticity less than the surrounding concrete and should not become brittle over time. This material may be combined with manufactured sand to form a PCC compatible polymer concrete that can structurally repair concrete cracks and spalls. Advantages– Due to the very low surface tension of the material and low viscosity, complete saturation bonding of cracks can be easily achieved. Minimal prep to remove loose debris is all that is normally required. This can be considered a structural repair if the material is allowed to gravity flow to the full depth of the crack. Manufactured sand or quartz may be introduced into the repair as necessary to prevent under slab ponding and martial waste. For repair greater than 0.125 inches, specified sand may be added at a ratio of two parts sand to one part mixed polyurethane as the crack is filled to extend the material and add strength. The sand also brings the thermal coefficient of expansion of the repair material closer in-line with surrounding concrete. Polyurethanes of this nature may be applied in a wide range to substreight temperatures making them useful in frozen and cold storage warehouse applications or cold weather application below -20F (-23C). Repairs are typically ready to accept traffic in approximately 10 minutes at 72F (22C). Roadware 10 Minute Concrete Mender™ mixed with sand gets about as hard as concrete, yet it’s modulus of elasticity is slightly less than concrete so it will move with the slab, not work against it. Spalled control joints and cracks. Typical crack injection repair techniques involve epoxy, ports, pumps, and pressure to force thick epoxies into a crack. Roadware 10 Minute Concrete Mender™ with its low surface tension can do same job in less time, less mess, and better performance. Roadware 10 Minute Concrete Mender can be injected into a wide range cracks and delaminations using a simple cartridge and special Soft-tip injection mixers. Successful full-depth repairs have been made in 24″ of concrete. Hairline cracks repaired using Roadware 10 Minute Concrete Mender and Easy Injection application. Comprehensive testing by Opus International Consultants – repairs have consistently achieved results higher than the manufactured panel. Full training in the system – a step by step training video and instructional booklet is included within each kit. Save time and money! Conventional repair methods with epoxy have longer repair times, additional downtime and are more expensive. Use a hand gun – no need for expensive pumps! The Gebbie Tech System uses the cost effective Roadware 10-Minute Concrete Mender™ hand gun to repair walls. Complete penetration. Due to the composition of the Roadware 10-Minute Concrete Mender™ the resin travels easily from the injection point. The approved vertical wall repair system. The Gebbie Tech System is listed in Roadware’s 10 Minute Mender Concrete Data Sheet as the approved method of vertical concrete wall repair. Repairs cracks from a hairline through to quarter inch. Walls are repaired within 2 – 12 hours depending on the temperature, and the length of the cracks. Polishing your floor to a mirror like finish? Repairs made with Roadware 10 Minute Concrete Mender™ will not smear into the surrounding surface or gum-up diamond polishing pads. You can even add natural sand to match the grain and color of the surrounding concrete. 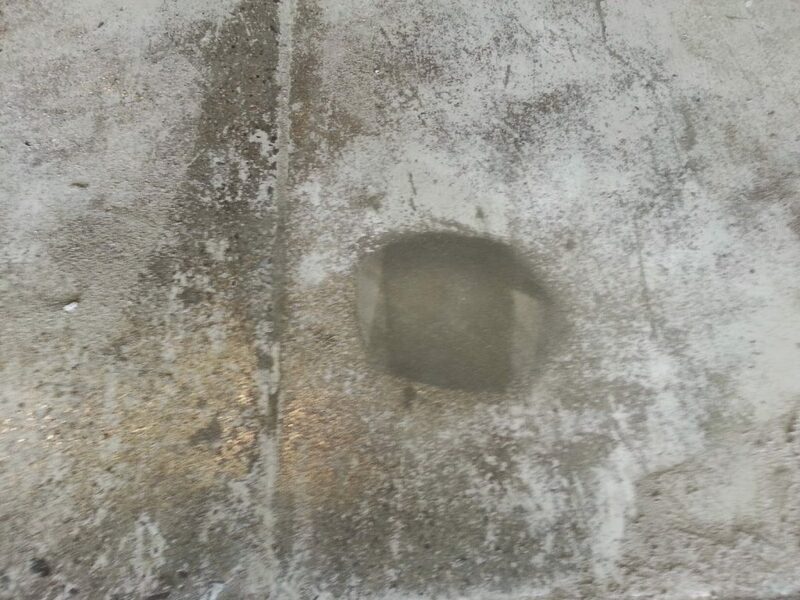 Polished concrete repair with Concrete Mender™ Off-white. The repair pictured above shows Roadware Concrete Mender™ Off-white blended with plain concrete sand and a small amount of portland cement. This water-thin polyurethane is almost translucent. When we add nearly any type of dry sand or aggregate, we get a fast-curing polishable repair that blends beautifully with the surrounding concrete. Since this material is almost translucent, it resists shadowing effects due to over-banding when applied. By adding two parts silica or quartz sand to a gallon of Concrete Mender™ you will yield about 2.2 gallons of repair material. A gallon of polyurea or epoxy will yield a gallon of repair material. That makes polyurea more expensive to use even at half the material cost! This does not even factor in the hidden costs of short repair life, damage to the surrounding concrete caused by pre-mature failure, or the cost of redoing the repairs when they fail. Roadware 10 Minute Concrete Mender™ hand packed with state-of-the-art packaging materials. They have to be good. The very low viscosity and surface tension require it. Due to the the extended working time formula, bulk mixing of Concrete Mender™ is easy. Unlike polyureas that start to gel up instantly, Concrete Mender will remain workable and flowable for several minutes before curing begins. Much less wasted product setting up in buckets. Roadware 10 Minute Concrete Mender can be easily mixed in a bucket with sand or used neat. No pumps of special equipment needed. With a Roadware needle tip mixer, you can apply Concrete Mender™ within-point accuracy delivering product to where it is needed most. Our needles come as small as 1.2mm in diameter. If you can get a finger nail in the crack, we can get some Concrete Mender in there as well. Working in the cold? We’re from Minnesota. 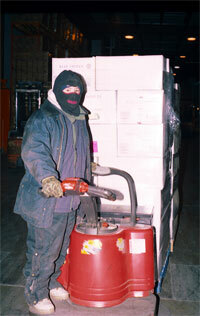 We know first hand what it takes to work in freezing temperatures. Roadware 10 Minute Concrete Mender™ can be applied at temperatures below -30 F ( -34C). That is really cold. Exposed flesh will freeze in seconds. That is almost too cold to go ice fishing. Most repair products would freeze solid before curing and quickly fail. Roadware 10 Minute Concrete Mender™ generates its own heat. Curing will take several hours, but you will still get the same great performance. Roadware Concrete Mender™ comes in two standard colors. Concrete Grey and natural off-white. Since a typical repair is made up of two parts sand to one part liquid, the color of the sand will determine the color of the finished repair. By adding colored quartz sand to off-white Concrete Mender, you can make custom colors as needed. Use Concrete Mender Off-white to make your own colored repair by adding different colored sand at the time of application. We also custom make Concrete Mender in Safety Yellow, Red, Blue, and Black. Use Concrete Mender Yellow to create permanent safety lines and marks in difficult areas like cooler and freezer floors. Roadware 10 Minute Concrete Mender™ is completely self-reacting and does not out-gas solvents or VOC’s when curing. This material meets FSIS guidelines for work is federally inspected meat and poultry plants. For over twenty years, Roadware 10 Minute Concrete Mender™ has performed without fail in thousands of applications. Many times outliving the facility itself. Concrete Mender repair in a cold storage warehouse after 15 years of heavy forklift traffic. Utilizing technology developed to repair bomb damaged runways for NATO, Roadware 10 Minute Concrete Mender™ was reformulated and brought to commercial markets in the early 1990’s. You can find us in nearly every industry that has concrete floors, decks, slabs or surfaces. Roadware 10 Minute Concrete Mender is made in the USA and is available from Roadware authorized distributors and dealers worldwide. Call 1-800-522-7623 or 1-651-457-6122 to find a dealer near you. 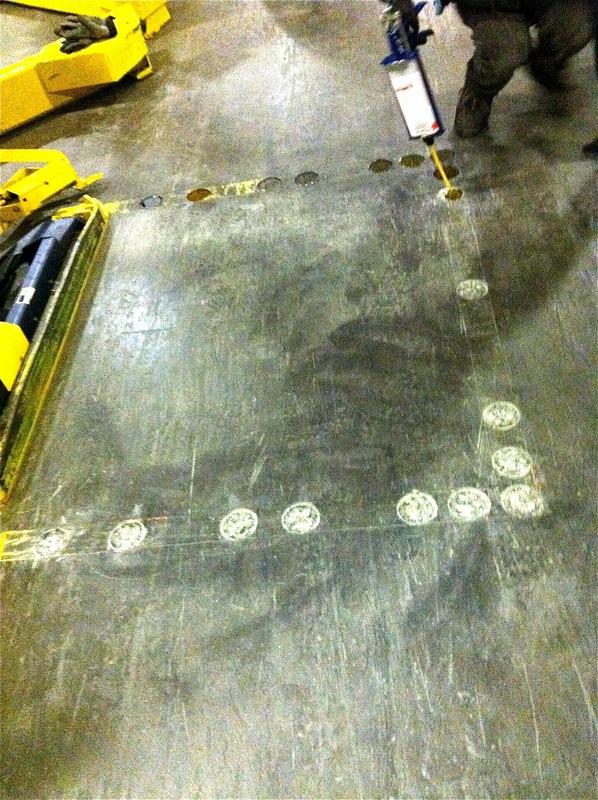 Roadware distributor Bill Bacha of Precision Devices in Connecticut has developed an innovative way to create yellow safety markings in warehouse and cold storage floors. By simply using a 4′ core drill and Roadware Concrete Mender in Safety Yellow, Bill can mark safety areas that are permanent and can be applied at temperatures well below freezing. Use a core drill to make 3″ circle impressions about 1/4″ inch deep. Fill the circles with Roadware Concrete Mender in Safety Yellow color. The safety circles will cure yellow in about 15 minutes at 70 degrees F or in an hour at 0 degrees F.
Roadware Concrete Mender in Safety Yellow permanently bonds with the concrete using Roadware’s Microdoweling™ technology. • Integral color will not peel or chip-off. • Apply in temperatures as low as -20°F. • Cures forklift traffic ready in 15 minutes at 70°F. • Based on Roadware’s proven Microdoweling™ technology. Roadware will be exhibiting in the World of Concrete 2011. This will be our 11th year at the show. Our booth will be in the South Hall S11847 at the Las Vegas Convention Center. For free exhibits only registration, use source code A20 when filling out the online registration form. This code is courtesy of the American Society of Concrete Contractors. Click here to register for the World of Concrete. 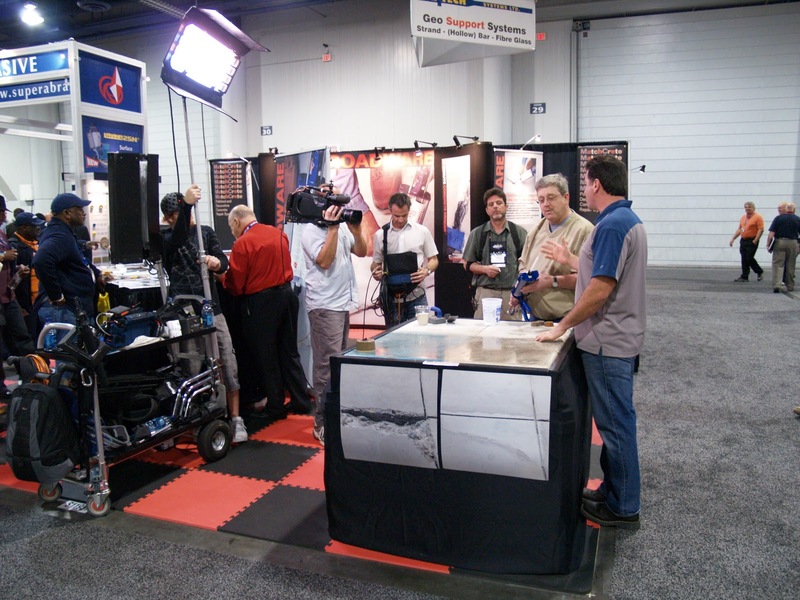 DIY Network filming a segment in the Roadware booth at the World of Concrete 2009. If your business is refrigerated warehousing or grocery distribution, Roadware 10 Minute Concrete Mender™ is the premier concrete repair product for keeping your floors in top condition. The unique Microdoweling™ polyurethanes in Concrete Mender™ will cure at temperatures well below -20 degrees F. ( -28 C) in just a few hours. You can repair cracks, spalls, slabs, joints, and surfaces while the warehouse is in service. Easy to mix one-to-one ratio polyurethane. Add manufactured sand to extend the material over to two times. Two gallons of Concrete Mender™ will make 4.4 gallons of repair material. Ultra low viscosity for easy application and workability. 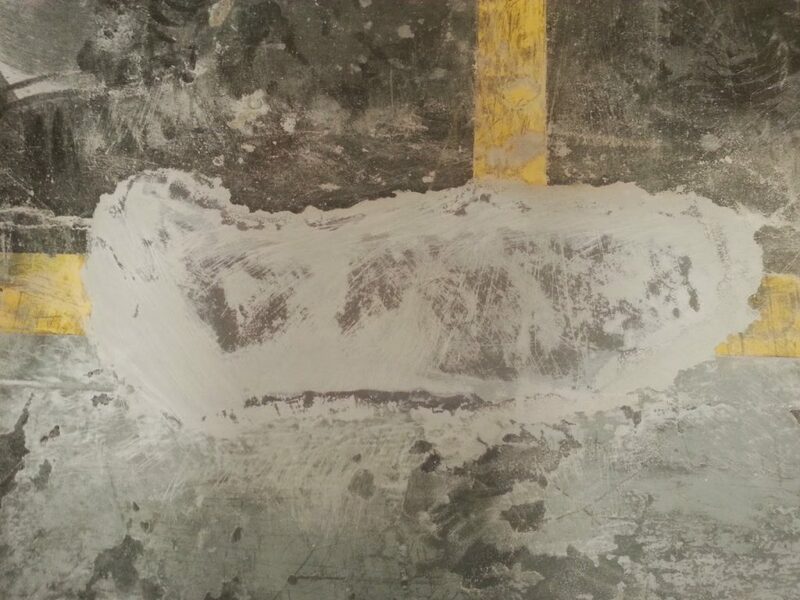 Microdoweling™ penetration into the concrete for load transfer bonding. Cures only has hard as the concrete. Will not become brittle like epoxy. Tough repairs that can take industrial levels of punishment. 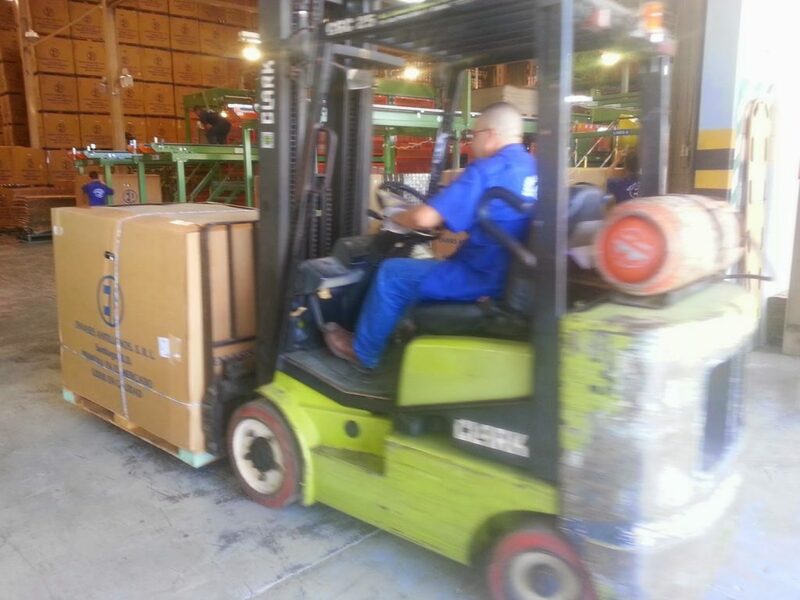 Less damage to forklifts and equipment. Clean floors. Meets FSIS and USDA guidelines. Less tipped loads and damaged product. Reduced cleaning and floor maintenance costs. Reduced workers comp claims attributed to accidents. Cold environments such as walk-in freezers and refrigerated warehousing pose difficult challenges for repairing concrete. In temperatures less than 0° F, most repair materials become unworkable and may take many hours to set and cure. Most epoxies are not usable below 32° F. Roadware Polyurethanes have been used in temperatures as low as -20°F below freezing. Listed below are some problems and solutions for working in cold environments. Frost: Frozen moisture in the concrete will act as a barrier between the repair material and the pours of the concrete. Most repair materials will try to bond to the frost coated concrete. When the temperature increases, the frost melts and so does the bond. Working Conditions: Working with materials in the cold is challenging to both man and materials. Mixing epoxies or mortars in the cold is especially challenging. As the temperature decreases, the viscosity and flow rate of these materials increase making them harder to mix and much more difficult to work with. Curing: With most materials, cure times in cold environments are extended significantly. A product that normally cures in an hour at room temperature may take as much as 12 hours in a cold environment. Some materials may not cure at all before actually freezing solid. The extremely low viscosity and rapid cure times of Roadware 10 Minute Concrete Repair products make them excellent for cold environment application. Successful repairs are routinely made at temperatures below -20°F in freezer floors. Preparation: Prepare cracks, joints, and spalls according to standard recommended methods. Make every effort to remove any moisture from the repair area. A propane torch or heat gun is very helpful in removing frost and moisture. In extreme cold, it is necessary to heat up the concrete prior to application. Application: Keep material and sand or aggregate warm. Place materials in a warm area (between 70°F and 90°F) prior to application. Warm cartridges mix better, flow easier, and cure faster. Apply material as directed. It is a good practice to pre-wet all concrete surfaces with material before the introduction of sand. This insures full penetration and a strong bond. Curing: Roadware materials are designed to cure in approximately 10 minutes when all components involved are at 70° F. In cold environment, the cure time depends on the temperature of the material, the temperature of the sand or aggregate if used, the volume of the repair, and the temperature of the concrete. Below is a chart of approximate cure times at various temperatures and conditions. Storage: Roadware material should be stored between 60°F and 80°F. Material stored in extremely cold environments should be slowly brought up to room temperature before use. It may be necessary to agitate material subject to extreme cold prior to mixing. Call Roadware Technical Services for further instructions (800-522-7623). 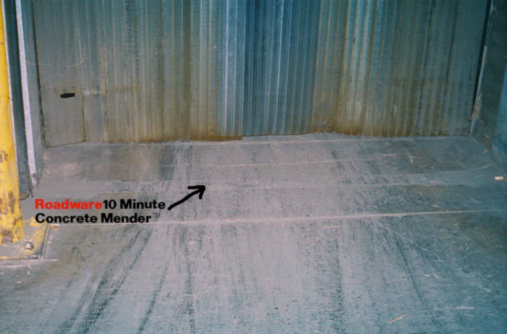 Roadware 10 Minute Concrete Mender™ saves food distribution warehouse thousands of dollars for over 15 years.